The Haunting of Hill House was written by Shirley Jackson in 1959. A finalist for the National Book Award, it’s considered by many to be one of the best horror stories out there, at least in the ghost story/haunted house category. It’s been remade into several movies, in 1963 and 1999, and spawned countless imitations. As with most classic horror, the terror in this book is subtle rather than graphic. 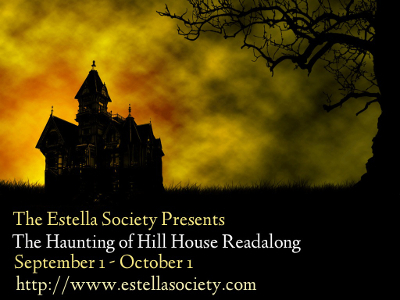 Hill House is portrayed from the first paragraph of the story as a character, feeding off of the insecurities of its inhabitants, and outlasting numerous generations. Hill House watches the characters as we read. Four main characters are staying in the house as an experiment, to observe whether it is indeed haunted. Dr. Montague has invited two women who have experienced supernatural events in childhood, so are therefore more open to psychic phenomena. Eleanor is a lonely woman who has spent most of her life caring for her mother. Theodora is adventurous, described as a rule-breaker. Also invited is Luke, the son of the owners, hoping to inherit the house one day. The characters experience feelings of terror the minute they pull up to the house. And the house doesn’t disappoint. These questions come from the Haunting of Hill House Readalong, hosted by The Estella Society and the R.I.P. IX Challenge (NOTE: spoilers here, especially the last question). Do you see Hill House’s horrors as being different for its male and female inhabitants? Any gender issues at play here? Jackson decides to write most of the story from the female characters’ point of view, mostly Eleanor’s. She focuses on Eleanor and Theodora’s relationships with each other and with others. Luke and Montague are absent from some of the scariest moments of the book, and seem to lack the perception that Eleanor and Theodora have. But that makes sense since they’ve been brought there specifically FOR their sense of perception. Being 1959, there could hardly NOT be gender issues at play here. Theodora is in a gender-ambiguous relationship back home, and Eleanor is struggling to assert her independence (she’s told by her sister at the beginning of the book that she’s not allowed to take the car, for example). Eleanor fantasizes about living alone, but at times seems desperately needy. She flirts with Luke and is jealous when he pays attention to Theodora, but at the same time isn’t terribly interested in him. Luke and Montague treat the women as fairly helpless, but it’s interesting that they do very little “saving” of anyone. Montague in particular seems fairly negligent, both in his role as scientist and as protector. He’s completely overshadowed by the women in the book, including his wife and Mrs. Dudley. What’s up with the ghostly disturbances in this book? Eleanor’s blooming telekinetic abilities, real-deal ghosties, a big mess of unreliable character? What say you? Eleanor’s thoughts and sensory perceptions are what make this book so fascinating. She’s clearly an unreliable narrator, but personally I don’t think she’s completely imagining things. She sees, hears, and smells things the others do not. I think the house somehow chooses when it wants to speak to her directly, and when it wants to manifest itself to the others. I will say the scene where they find the blood (red paint?) on the wall and the writing about Eleanor is when I seriously started getting freaked out. Now that I’ve finished, I really need to read it again to understand better what’s going on with Eleanor. 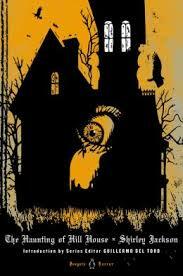 The Haunting of Hill House was first published in 1959. What aspects of 1950s culture or society do you see the novel critiquing, criticizing, or commenting on? I think this book speaks to the difficult position women are put in – expected to take care of their families, but without the means to live independently. The two women in the story are expected to fight over Luke, as the only young male in the house. There seems to be more sexual tension between the two women than between the women and Luke. Eleanor admires Theodora’s independent character, but despises her for it simultaneously. Her constant sense of competition with Theodora made me think that’s how most women are with each other, even close friends. Jackson may be commenting on the public’s fascination with psychic phenomena, but I’m not sure. She seems to ridicule Montague’s wife, who takes the idea of ghosts way too seriously (but also is much more take-charge than her husband, who is conspicuously passive until the end of the story). Interesting that Montague’s wife sees spirits as completely sympathetic while everyone else sees them as malevolent. The book suggests that’s because she’s simply not sensing anything in the house at all – and yet they do pick up a message about Eleanor without knowing about the other messages. Most Gothic novels are written in an ornate style, but Jackson chooses a simplistic style with a conversational word choice. What does it add to this harrowing tale? Do you find that it detracts in some places? While we don’t know exactly where Hill House is, Jackson’s voice gives this book an American feel. She weaves symbolism and drama throughout the story, but the characters also laugh and joke and speak plainly with each other. I liked the way the four main characters interacted with each other, exploring the house, playing games, and making up fantastic stories about themselves. In contrast, you have Mrs. Dudley, the housekeeper, who repeats the same few lines over and over again (humorous but also adds to the creepiness). I think Jackson uses light conversation to contrast with the dark atmosphere of the house – and the dark personality of Eleanor, who never quite seems to get the jokes. The Big One: what is it about Hill House that allows it to consume Eleanor’s sanity so efficiently? Or, what is it about Eleanor that allows Hill House to consumer her sanity? Eleanor is really a fascinating character, and one I wanted to get to know better. Of course we’re limited in getting to know her, because we don’t know what’s in her head and what’s real. Does Hill House consume her, or does she “consume herself”? Since I like to “believe” in fantastic fiction, I lean towards the House as a predator, seeking out its weakest inhabitant, finding her sore spots, and taking advantage. I sympathized with Eleanor’s loneliness, her desire for independence, and her insecurity/paranoia about what others think of her. Also her need to fantasize about her life rather than face reality. Even as she’s driving to Hill House, she sees the house as her one chance to change her life, and you can see that she’s not going to be driven from it. Thanks to Estella Society for questions that really made me think about the book in different ways. Fantastic review! I really enjoyed your insight into Eleanor! I don’t want to read too many of your answers because I haven’t read this one! It sounds pretty scary and I am kind of a wimp, so I’m not sure if I will pick it up. I loved Mrs. Dudley. Best character in the entire book. I get the feeling that she acts creepy on purpose because it entertains her. I read this book in college and have watched The Haunting countless times. It’s one of the most psychologically complex and perplexing stories of the past century with some wonderful scares. This and “Turn of the Screw” by Henry James tend to leave me staring at walls and trying to decipher the truth. What great fun! Thanks for the great review and chance to ruminate about one of my favorite novels.